It is the fifth of 24 races during the 2019 NHRA season, and plenty of high-powered, 10,000-horsepower thrills will be on display at one of the quickest tracks on the NHRA circuit. That means fans will be treated to plenty of 330-plus mph action in the Lone Star State, as the track enjoys ideal atmospheric conditions thanks to its proximity to Trinity Bay. With the top stars in NHRA's nitro classes looking to start the season strong, fans can expect more excitement in 2019. Teams in Top Fuel and Funny Car will again battle for an important early-season race victory and critical world championship points at the stop just outside of Houston. 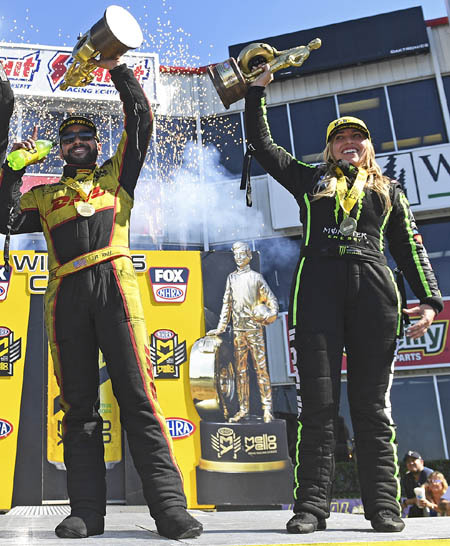 Brittany Force (Top Fuel) and J.R. Todd (Funny Car) were last year's winners of the event, which will include live finals coverage on the FOX national broadcast network starting at 3:00 p.m. (ET) on Sunday, April 14. It marks the NHRA's 2019 season debut on FOX. Brittany Force, the 2017 Top Fuel world champion, picked up her lone victory of the season a year ago at Houston Raceway Park powered by Pennzoil. It was also her first victory of the facility and she'll head to the race on a good note after qualifying No. 1 in Gainesville. But to grab her first victory of 2019, she'll have to get past a star-studded list of drivers that includes points leader Doug Kalitta, who won in Pomona to open the year, Gainesville winner Richie Crampton, defending world champion and Texas native Steve Torrence, his father, Billy, 2017 event winner Leah Pritchett, Terry McMillen, Clay Millican, Antron Brown and rookie Austin Prock. In Funny Car, Todd used the early-season momentum from his victory in Houston to start the road to his first world championship. Todd, who won six races a season ago, has yet to win in 2019, something he'll look to change at the SpringNationals. But it won't be easy against the red-hot Robert Hight, the current points leader who has been the No. 1 qualifier at the first three races and has won two of them. Todd and Hight dueled at the end of 2018 in a thrilling championship battle, while others to watch in Houston include Phoenix winner Matt Hagan, John Force, who has seven Houston wins, four-time event winner Ron Capps, Jack Beckman, Tommy Johnson Jr., Shawn Langdon, Tim Wilkerson, Bob Tasca and Cruz Pedregon, who has three Houston wins. Along with exciting on-track action, the Mopar Express Lane NHRA SpringNationals presented by Pennzoil will honor first responders with NHRA's "Salute to First Responders" celebration. To purchase reserved seats, call (281) 383-RACE (7223) or visit www.houstonraceway.com. Kids 13 and under are free on the spectator side with a paid adult. To honor NHRA's Salute to First Responders, military and first responders can save 20 percent on reserved tickets in advance or at the gate.